I’m on a roll here with black & gold after the last folding chair makeover. I can’t help it, they just look so great together. If black is a bit harsh for you try a different colour, gold goes well with pretty much anything. So I was at a friend’s house and they were just finishing up a reno with some nice marble tiles and knowing that I’m such a scavenger & DIY’er asked me if I wanted the extra? 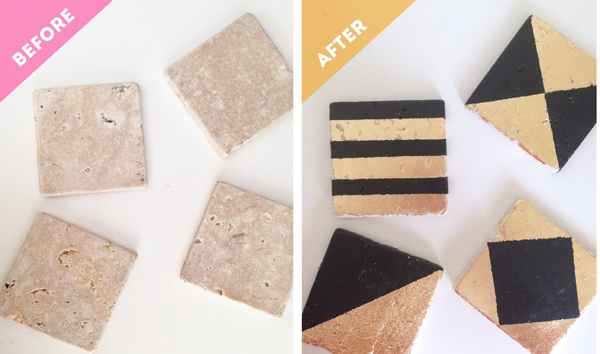 I immediately had a vision for these geometric gold & black coasters. Check out how I brought my little light bulb moment to life. So they started as pretty basic beige (blah!) 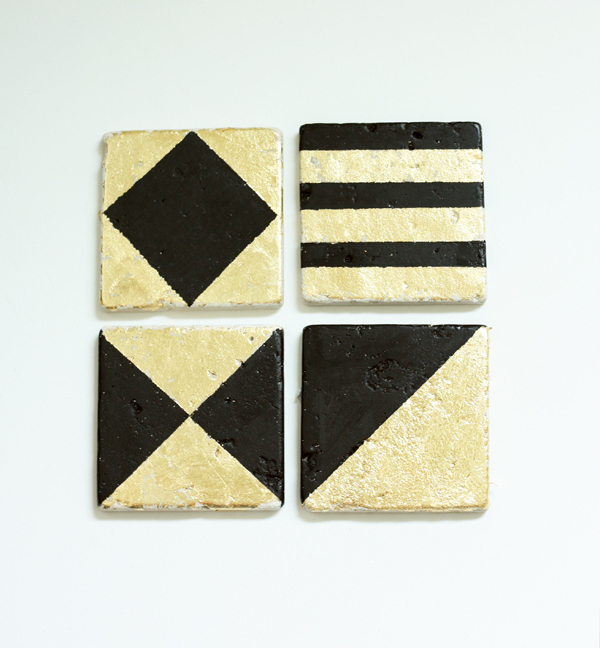 marble tiles and now live on as stylish and trendy geometric coasters. 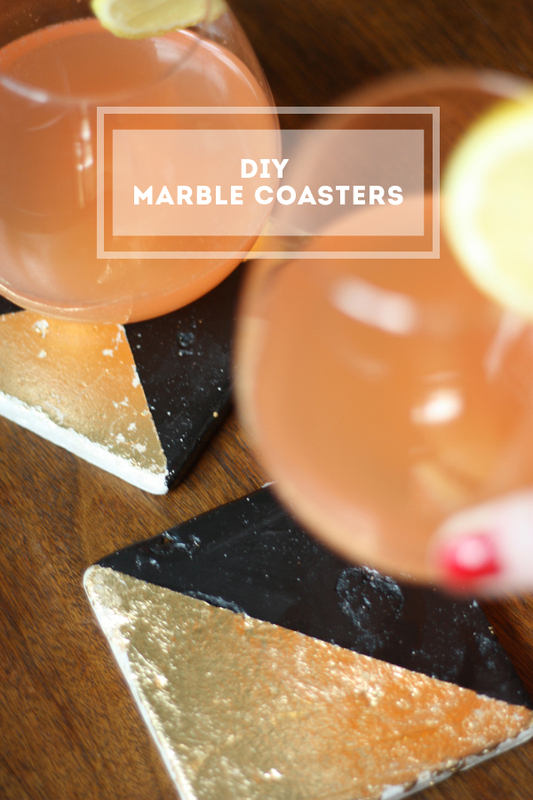 And there you have your finished trendy coasters. Give them a spray of clear acrylic sealer for protection and glue some felt on the bottom to protect your furniture and you’re done! You can always also just choose to pick one of these patterns and make them all the same. 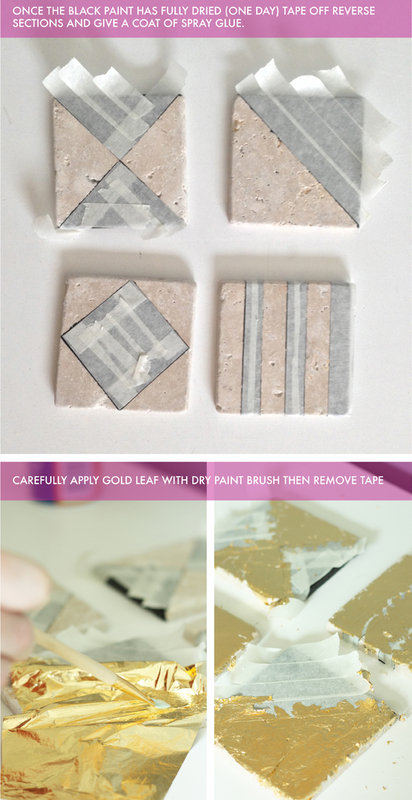 Or if you you’re a neutral kinda person you can even forget about using a paint colour and just leave the natural marble exposed, it will look great with the gold. Make up your own patterns or use even more colours if you want. You get the idea. It’s an easy way to incorporate a trendy colour into your space without commitment. So stylish and fun Melissa! I really love your photos too! Thanks Rachel! And extra thanks for the photo compliment because it was a struggle with this one. I tried following this method and all of my guests have complemented it saying that it looked really good. I just hope that people can be more creative like this on a regular basis.